In the Rider Waite version of the Five of Wands there are five men holding wands up, appearing to be fighting. 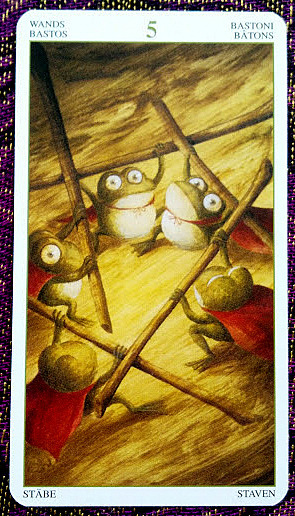 They are all wearing different colors, but in the Tarot of the Magical Forest all of the frogs are wearing the same red cape, which gives me the feeling that they are on the same team, or perhaps are even the same frog. The same frog fighting against himself. Over the weekend I was so excited about my goals because I had a vision, and I was sure I knew the steps to take to accomplish them. Today, I feel scattered. There are so many things I want to accomplish that I don't know where to begin. It all makes me feel a little tired. That kind of tension makes me want to run and hide and deal with it all another day. I need to narrow my focus. Pick one goal at a time as the primary focus of my attention and energy. That's easier said than done for a woman with a family to care for with the holidays looming, but as important as those things are, my personal goals are more important because they are life to me. Without them I will wither and die. Does that sound dramatic? Well, yeah, it's stated dramatically because it really is that crucial that I not continue to push my hopes and dreams out of the way to make room for all of that "important" stuff. Okay, decision made. I know where I'll focus today, and the truth is, I'll still have time for that "important" stuff. I love your positive take on refocusing your energy with this card! Thank you for sharing!